It doesn't matter if you are a beginner or a pro tour rider, being setup correctly on your bike is a must. That sounds pretty straightforward and simple. And in most places, bike fitting is a cookie-cutter process of applying tools to figure out body-to-bike geometries. But that’s not what we do here—because cookie-cutter solutions only work on cookies. Humans are far too complex to fit into a one-size-fits-all system. Instead, we’ve spent years developing a holistic process that incorporates the complexities of each rider to create uniquely individual fit and position solutions. We start by getting to know you, your cycling history, how often you ride, your goals, and any issues related to achieving an optimal fit. Developed by a physical therapist, our assessment allows us to evaluate your cycling-related flexibility and core strength and how they relate to the fitting process. 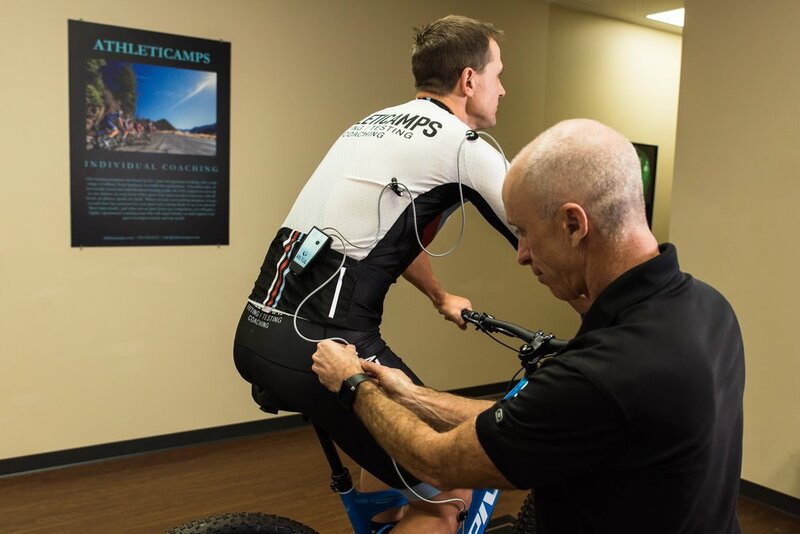 The assessment helps us understand any physical issues you’re having and allows us to create a personal home program plan for off-the-bike work that will improve your comfort and performance. Your feet are the foundation of your pedal stroke. When your feet are incorrectly aligned, painful, or not functioning as they should, your cycling suffers (and so do you). We use FootBalance technology, because it’s the best we’ve found, to diagnose issues and quickly custom craft a product that addresses comfort, power, and efficiency issues for a stronger, more relaxed foot. If you wish to, you can purchase the fully customized inserts and use them in any shoe. Before and after your fit, we use Retül's Zin digital measuring tool to take detailed measurements of your bike with millimeter accuracy. The measurements let you see the changes made on the bike during the fit process and give a detailed record of your final setup. We believe it’s important for you to understand what we’re doing and why. We explain every adjustment we’re making and how they will improve your comfort, performance, and economy. The majority of athletes that visit us need to work on issues off the bike that create problems when they’re riding. After every fit, we go over specific strength and flexibility exercises with you so that you leave the fit knowing exactly what you have to do to achieve more balanced structural fitness. You receive a detailed report via email with 24 hours of your visit. The report contains our notes, before-and-after measurements of the bike, before-and-after data captures of you in motion, and before-and-after pictures. We also keep your data and reports on our system for easy reference should you buy a new bike, add a new component, or simply have a question. Another benefit of working with us is that we’re independent professionals who are not connected to a company that’s trying to sell products. Our lack of company affiliation allows us to maintain an objective, product-neutral approach, so that we can freely recommend what’s truly best for you. We have a variety of replacement parts and brands available and choose the best components that compliment your fit and budget. We understand that your saddle is probably the biggest contributor to bike comfort. When needed, we take during your fit to understand your body and riding style and help you find a saddle that gives you long-lasting comfort and performance. Our saddle library demo program allows you to try out saddles to determine which is best for you. We have an outstanding long-term relationship with nearby Folsom Bike shop, which gives our clients priority on any changes we can’t do at our training center. For example, if you need new cabling installed, Folsom Bike will give you priority in getting the work done. We know your time is valuable. We maintain and appointment-based system and stay on time to deliver your services in the estimated time so that you can plan your visit accordingly. Our training studio offers a relaxed, professional feel where you can be assured you are receiving the attention you deserve. As a full-service training center, we view your improved performance as our product. That’s why we take a complete approach that includes coaching, skills training, performance testing, and structural health. It’s also why we’re here whenever you have questions or need advice on progressing to the next level.